Baseball’s Prince Fielder is a vegan. So is NFL star Arian Foster (most of the time), mixed martial arts pro Mac Danzig, ultra-marathon runner Scott Jurek, the Toronto Maple Leafs’ Mike Zigomanis and bodybuilder Derek Tresize. Yet, while the vegan diet, which is totally plant-based (no meat, fish or dairy), nudges its way into the mainstream of society, questions about its benefits proliferate—especially when competitive athletes adopt it. In the minds of many people, including some nutrition experts, athletes must consume meat and dairy products to build muscle and get into optimal condition. This belief isn’t grounded in scientific evidence—because none exists. So while the issue is a “he said, she said” dispute based on subjective, anecdotal evidence, a growing number of “on the ground” experts—nutritionists, athletes or some combination thereof—are giving vegan competitors the green light. Will the diet give me what I need for optimal performance? Will I get enough nutrients to maximize energy? Be careful not to be overly restrictive. Eat a variety of foods to avoid nutrient—and energy—deficiency. If a client approaches you with questions about converting to a vegan diet, refer him or her to a registered dietitian, especially one well-versed in the vegan diet. If you’re a vegan, don’t try to convert your clients and by all means avoid the argument that eating meat is unethical. The answer to the first question is “Yes,” if you’re doing it right. Felicia Stoler, a nutritionist in Holmdel, N.J., says, “It’s difficult to be a competitive athlete as a vegan, because all athletes have higher-than-normal protein and calorie needs. And animal sources of protein are complete and bio-available, [meaning the body can use of them more readily], compared to protein from plant foods.” That said, by carefully choosing complementary protein sources and monitoring overall intake, vegan athletes can consume adequate amounts of protein to fuel their performance. Debate also continues about whether the benefits of a vegan diet vary depending on the athlete’s sport and type of training—for example, going vegan may make it more difficult to build the muscle mass necessary to compete in power sports, but may not be as much of an issue for endurance athletes like marathoners or cyclists. 1 It’s estimated that 12 percent of a vegan diet is protein. If a power athlete burns 1,500 calories in a workout, it’s easier for him to replace the necessary protein than an endurance athlete who may burn 2,500 calories. Athletes such as Tresize and Arian Foster have proven that it’s possible to be an elite vegan power athlete. Regardless, competing as a vegan in any sport presents challenges that carnivores don’t face (see sidebar on NFL tight end Tony Gonzalez’ experience with going vegan). Why Do People Become Vegans? 2. Many vegans argue that eating animal flesh is unethical, and they object to the conditions animals are subjected to in the industrial food system. 3. Vegans claim that plant-based diets enhance the environment, that they produce fewer greenhouse gas emissions and require only one-third of the land and water needed to produce a typical Western diet. Haver says that vegans can get all the protein they need from soy products, legumes, beans, lentils, leafy green vegetables (up to 43 percent of their calories are protein), nuts, seeds, whole grains (such as quinoa, which is the only plant complete protein), wild rice (which has 7 grams of protein per cup) and sprouted grain breads (8 grams per slice). Iron is another nutrient potentially elusive to vegans. The good news is that you can get it readily from many plant-based foods, as long as you don’t consume it with foods that inhibit its absorption, such as tea and coffee, or—and here’s the tricky part—consume high amounts of calcium. Zinc is another important nutrient more commonly found in—and better absorbed from—animal products. 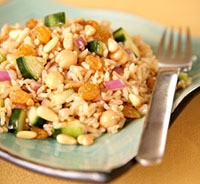 The best plant-based sources are legumes, nuts, seeds and whole grains. “We don’t know very much about zinc absorption, so I wouldn’t recommend taking supplements,” Larson-Meyer says. Would you believe that there’s a worldwide deficiency of vitamin D (a performance-enhancing nutrient linked to immune health, inflammatory mediation and muscle function)? It’s true, perhaps caused by our office-based work lives and, ironically, excessive use of sunscreen. It’s most accessible in dairy products, so vegans must turn to cereals, soy products and orange juice fortified with it—or spend 10 to 15 minutes a day in good, old-fashioned sunlight. 2 Nieman says the volume of plant foods is higher than meat products—because they contain more fiber, which goes undigested—but not the number of calories. 3 A study from Oxford University found that vegans have a 30 percent higher risk of bone fracture, possibly as a result of lower calcium levels in their diet. To return to the question of optimal performance, the consensus is that vegan athletes can train exactly the same way as non-vegans. It’s all about the diet. Haver says that, in general, the worse your diet was to begin with, the greater the chance you will feel some initial gastrointestinal discomfort due to increased fiber consumption. But these “detox symptoms,” as she puts it, only last a few days. 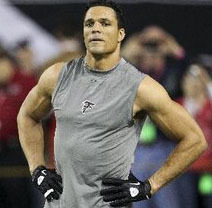 Tony Gonzalez: Performance or Health? All-Pro tight end Tony Gonzalez, most recently with the NFL’s Atlanta Falcons, put his career on the line when, several years ago, he sidestepped the meat-laden locker room smorgasbord in favor of a vegan buffet table. His conversion moment was a chance encounter with a fellow airline passenger, who introduced him to The China Study, a 2006 book (and Bible to many vegans) by Cornell professor and nutrition researcher Dr. T. Colin Campbell. The China Study claims that people who eat mostly plants have fewer deadly diseases than those who eat mostly animal flesh. Campbell’s evidence was diet surveys and blood samples of thousands of Chinese. Even as Gonzalez became convinced that a carnivorous diet could shorten his life, he feared that a vegan diet could also jeopardize his career—and his chance to break the all-time record for receptions by a tight end. In training camp (with the Kansas City Chiefs), he lost strength, then weight. In desperation, he called Mr. Campbell, who suggested adding more plant protein to his diet, but it wasn’t enough. Then the Chiefs’ nutritionist, Mitzi Dulan (a former vegan athlete), convinced him to “cheat” and add a few servings of fish and chicken per week. Gonzalez regained his strength and confidence, and in that season’s final game, broke the reception record. Perhaps Gonzalez’s story inspired Houston Texans’ running back Arian Foster, who adopted a (mostly) vegan diet during the 2012 off-season and led the league in touchdowns. Jim Gerard is an author, journalist, playwright and stand-up comic. He has written for the New Republic, Travel & Leisure, Maxim, Cosmopolitan, Washington Post, Salon, Details, New York Observer, and many other magazines. For more information, visit his site at www.gangof60.com. Does Social Media Help or Hinder Your Clients' Weight-loss Efforts? Part of our mission at ACE is to connect qualified fitness professionals with people who need them most, which we do through our Find an ACE Trainer tool at ACEfit.com. Make sure you’re putting your best foot forward by updating your My ACE profile today. Join ACE Exercise Physiologist Pete McCall for ACE's newest free webinar, Understanding Myofascial Anatomy, on March 20. Learn how fascia and connective tissues work synergistically to control movement, and methods of organizing exercises tailored to the way your clients move. Named the “World’s Greatest Athlete” at the 2008 Olympics, Bryan Clay went from being a drug-abusing kid to a gold medalist in the decathlon. Hear how he’s used his struggles to help others at ACE West on May 16-18 in San Diego, Calif.
Sign-up to receive Certified News, ACE's free monthly certified professionals e-newsletter. ACE's Certified News is produced 12 times per year by the American Council on Exercise. No material may be reprinted without permission. Technical Editor: Cedric X. Bryant, Ph.D.